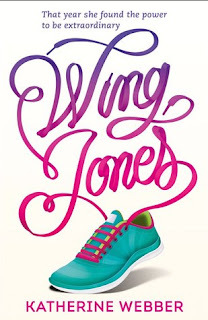 I so loved Wing Jones by Katherine Webber. Wing Jones is definitely a book that I heard a lot about, way before publication date, and I'd been looking forward to reading it for some time. I am sometimes nervous to start such books, for fear of them not living up to expectations. But this book? This book was beauty and love and hope all wrapped up in this gorgeous cover. Katherine Webber has this great way of writing. A very visual, imaginative style and I absolutely adored it, and Wing and her family right from the start. We're quickly introduced to Wing Jones, half-Chinese, half-Ghananian and her family of single mom, bickering grandmothers and an older brother who soaks up all the limelight. This story is set in Atlanta in the mid-90s, and I loved it so very much. I guess the biggest, most enjoyable thing for me in this book was witnessing Wing's transformation after a tragedy occurs involving her older brother, and how Wing chooses to adjust to this new life in which her brother isn't the shining beacon that she's always looked up to, always believed to be perfect. In her anger and sadness, she goes on on night-time runs and finds she's really fast and good at running. Wing Jones has such a great cast of characters. My favourite characters are, of course, Granny Dee and LaoLao, Wing's two grandmothers who are constantly arguing in this way that was both sad and adorable. But I also loved Wing, herself, some new friends she makes throughout her journey, seeing Marcus as a more complex person as Wing's brother, Monica, his girlfriend. And then there's Aaron, Marcus's best friend and Wing's crush. I really loved seeing Aaron through Wing's eyes. Wing Jones is a story that has so much going for it. I loved the little glimpses into what Wing goes through when meeting strangers and their confusion as to how her family fits together. I loved these things because I could relate to them so much, same as the stares, the looks, the questionable things people say like it's okay (it isn't). It has this cute romance to it but also really complicated and emotional family relationships and friendships. But as I've said before, the highlight for me is Katherine Webber's writing style, in bringing all of this together she weaves this beautiful story together of picking ourselves up after tragedy, of finding who we're meant to be. This book counts towards the British Books Challenge 2017.